The next in a series of free lectures from Bournemouth University (BU) will take place at Bournemouth Natural Science Society on 24 January. BU’s Fusion Inaugural Lecture Series provides an opportunity for professors from across all faculties at the university to share their research and its impact on society. 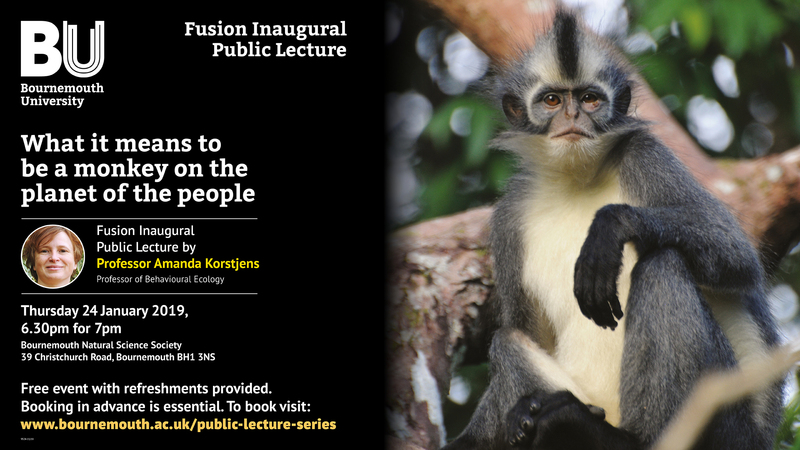 In this lecture, Professor Amanda Korstjens, a behavioural ecologist, will be sharing insights into a career that has taken her all over the world as she explores the effects of environment, human activity and climate change on primates. The data gathered through these research projects is then fed through to local organisations that are able to influence the ways in which forests and national parks are managed. Without the underpinning research, these organisations would not have the evidence they need to make changes to conservation practices. “During my inaugural lecture, I will be discussing my international research and its implications for practice. I will be drawing on examples from my career as a whole – from where I first started to the present day,” says Professor Korstjens. The lecture will take place on Thursday 24 January 2019 at Bournemouth Natural Science Society. Doors will open at 6:30pm, with the lecture beginning at 7pm. Free tickets can be booked here.